Happy Meal and I were originally going to meet The Marinater at The Fig Tree in Venice, CA, but that joint was closed when we arrived at 7 PM. We were already beachside in Venice, so we walked a block or so to the next restaurant that we saw, and they had a burger on the chalkboard. Sold! The establishment was Candle Cafe and Grill. Parking? We were in Venice, CA, so parking was a giant pain in the arse. We parked many blocks away and hoofed it. Anyway, Candle Cafe and Grill was right by the beach, but it was already dark out--we sat inside. The establishment was kind enough to provide Snuggies to its outdoor patrons...nice touch. We ordered a triumvirate of cheeseburgers and settled in for a 15-minute wait. The Beef: Candle Cafe and Grill used 80:20 Certified Angus Beef (CAB), and the cut was Chuck. Accordingly, we ordered our burgers Med-Well. The burgers were beefy. The grind was coarse, so the burgers had a pleasant firmness to the bite. The burgers were juicy without being greasy. The was not a hint of funk, iron, or other notes to complicate the simple flavor of beef and spices. There was a little more connective tissue than I cared for, but Happy Meal didn't seem to mind. The Seasoning: A generous blend of salt and pepper was used to season the exterior of our1/4 pound burgers. Salt and pepper was all that it took to maximize the flavor that the Chuck brought to this party. The seasoning was just right. The Sear: The sear on the cheeseburger at Candle Cafe and Grill came courtesy of a hot flat top. The sear was reasonably dark, but it lacked any real crispness. 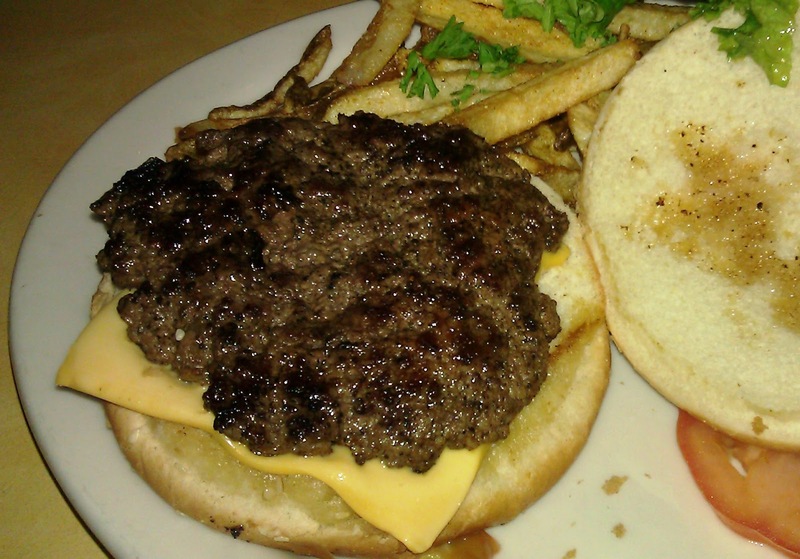 Looking back, it would have been tough to get a great sear on a 1/4 pound burger. The Preparation: The burger patties were formed gently, so that any protein bonds that formed were minimal. This resulted in tender rather than chewy burgers. The burgers were cooked to a competent Med-Well. Chuck burgers taste best when cooked to Med-Well, because it brings them up to a temperature where the collagen melts. It's that melted collagen that creates the potent, beefy taste associated with Chuck. 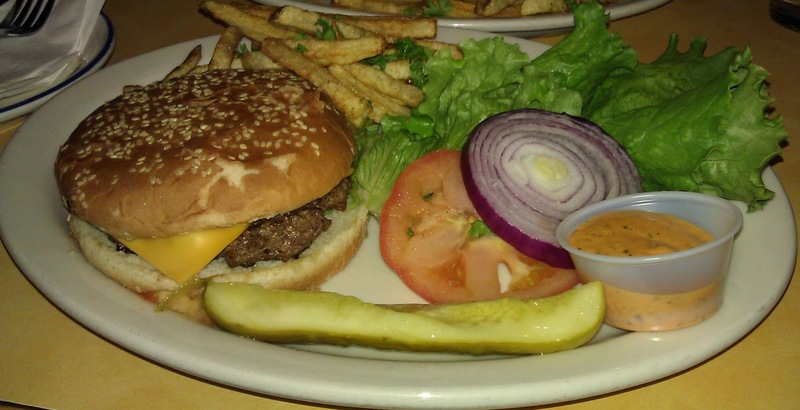 The Cheese: We ordered our burgers with a slice of American cheese. The American cheese did its job. Sadly, they dinged us for an extra buck for it. So it goes. Still, I love American cheese. It is simply appropriate on a cheeseburger. The Bun: The bun was delivered by California Bakery of San Diego. The seeded burger buns were fresh, moist, sweet, yeasty, and lightly toasted. I would have preferred a crispier bun, but this was fine. The Meat To Bun Ratio: The buns were probably better suited to Candle Cafe and Grill's 1/2 pound burger, but the bun was moist enough that it didn't completely overwhelm the burger patty. The Toppings: The menu promised Butter Leaf, but the Romaine that showed up in its stead was just fine. The tomato slice was on the green side, but it was flavorful and not at all mealy or hard. The chipotle aioli was especially nice, and it went well with the fries. The Fries: These were cut in house. 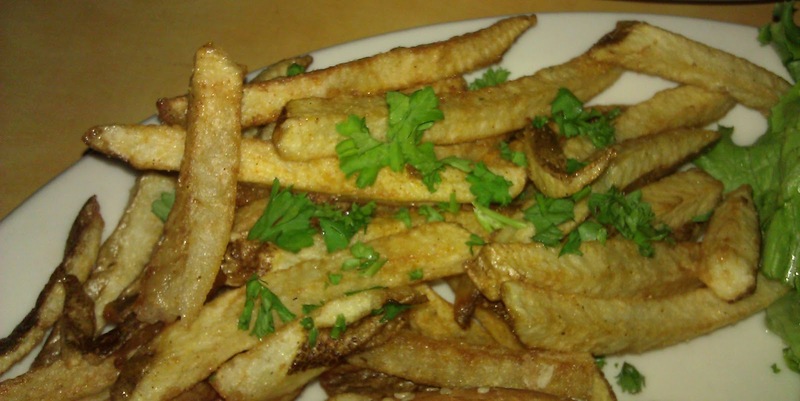 The fries were peel-on, par-cooked, and fried to a perfect color in vegetable oil. Candle Cafe and Grill seasoned the fries in vinegar and sea salt. Delicious! The interiors were creamy while the outsides were crisp. The fries were the star of the meal. The Value: 10 bucks for a 1/4 pound of Chuck was a little too much. Still, the burgers were good, and the fries were better. Candle Cafe and Grill served up a fine burger and some truly excellent fries. It made me wonder why everyone didn't use vinegar and sea salt on their fries. I was an instant convert. Burger Review : The burger was fine but a little pricey. The fries were epic.